Noeun Bunny married his wife Pork Srey Nic in 2015. Like many young couples, they dreamed of starting a family. It wasn’t long before this dream came true and now they have a young daughter. To support his young family, Noeun worked in a garment factory for years. This was until he was selected to participate in Cufa’s LEED program and become a business owner. Noeun’s previous work in the garment factory taught him a range of sewing and craft skills. However, the job involved extremely long hours, it was very far from home and the factory had very poor management. He wanted to be able to better care for his young child and be able to spend more time at home. For this reason, Noeun decided to open his own business and become a tailor. 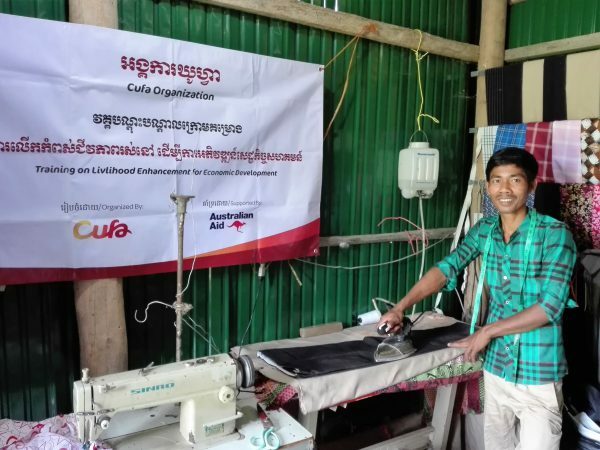 Since receiving the support of Cufa’s LEED program, Noeun has attended capacity building training, micro-enterprise development training and received one-on-one consultations from Cufa project officers on how to improve his business. After developing a business plan, gaining training in marketing strategy and microfinance, Noeun’s business has rapidly increased. Noeun has been able to purchase new sewing equipment and has a larger range of materials including branded materials. Thanks to all this training and the beneficial changes that have been made, Noeun believes his business has tripled and this has led to him increasing the financial support he can provide for his family. “It is a good location, I have more confidence in managing my business and the future looks great for me and my family!” said Noeun. 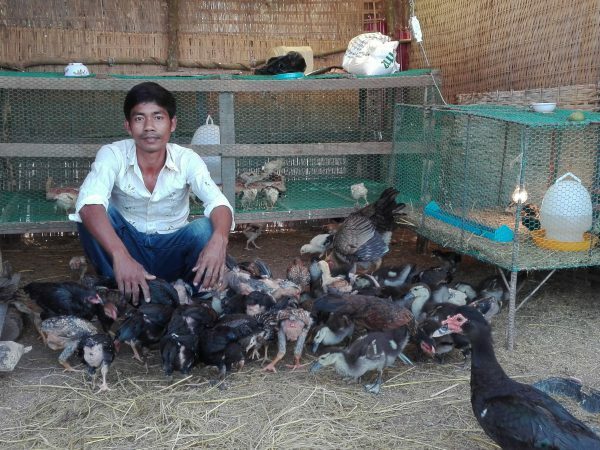 Through many of his new business skills, Noeun has been able to manage his daily expenses, reinvest profits and even save some of his income, which is amounting to around 10,000 Cambodian Riels a day or $3.50. He has even been able to invest in a small second business farming chickens. The improvements in the living conditions of his family are evident and many of his neighbours often ask him how he gained such success. Noeun credits much of the success as a business owner to the support he received through the program, primarily in building his business skill set and buying new materials. Learn more about how our LEED program is supporting business owners across rural Cambodia.